Perhaps even more stunning is the fact that Top Rank expects to sell several thousand closed-circuit seats at the Wynn Resort to accommodate those fans who want to see the show but were unable to get a ticket. Just a mile or so away from the Thomas & Mack at the MGM Grand Garden, a card headlined by Canelo Alvarez against Josesito Lopez is also thriving. Golden Boy Promotions CEO Richard Schaefer said his fight is closing in on a sellout and that over 15,000 fans would attend. An MGM spokesman confirmed those figures. When the cards were announced two months ago, it seemed to be setting up for an unmitigated disaster, having two major shows going head-to-head in the same city at the same time. As it is turning out, though, the news couldn't be more pleasant for the bitter rivals. Chavez and Alvarez are clearly positioned to become the sport's dominant players, succeeding Mayweather and Pacquiao as boxing's top drawing cards. They're already massive stars in their native Mexico, where their fights are as big as anything on television. According to Ibope, which is the Mexican equivalent of the Nielsen ratings, Alvarez's May 5 fight against Shane Mosley had a rating of 26.1 and attracted slightly more than 14 million viewers on Televisa. The astonishing thing about that number is that it exceeded the ratings on Televisa, Mexico's largest network, of the Mexico-Brazil men's gold medal Olympic soccer game in August. That show garnered a 19.1 rating and attracted 10.3 million viewers on Televisa. To be fair, the soccer game was simulcast on TV Azteca, where it did a 13.2 rating and drew 7.1 million viewers. "This kid is huge and he's only going to get bigger," Schaefer said of Alvarez’s popularity. The same, clearly, is true of Chavez, whose name is royalty in Mexico. Chavez's father, Julio Cesar Chavez Sr., is probably the biggest sports figure in Mexican history and much of his popularity has been conferred upon his son. Chavez's title-winning effort over Sebastian Zbik on TV Azteca last year was the third-most watched boxing event in Mexico. It trailed only the Pacquiao-Juan Manuel Marquez fight in November, which did an astronomical 40 rating, and the Pacquiao-Mosley fight in May 2011. The Pacquiao-Marquez fight was the most viewed television show of any kind in Mexico in 2011. "This is just evidence that boxing is a very thriving business right now," Top Rank president Todd duBoef said of the ticket sales in Las Vegas and the television ratings in Mexico. Top Rank chairman Bob Arum expects to sell between 400,000 and 500,000 on pay-per-view, which, if it does that, would make Chavez-Martinez the third-highest selling pay-per-view bout of 2012. Mayweather sold 1.25 million for his May 5 bout against Miguel Cotto, while Pacquiao sold 900,000 for his June 9 loss to Timothy Bradley Jr.
Mark Taffet, the senior vice president of sports operations and pay-per-view at HBO, said the appetite for the sport is growing rapidly. "We've seen indicators that boxing viewership is not only growing, but reaching new and different audiences," Taffet said. "Some of the shoulder programming for this [Chavez-Martinez] fight like '2 Days' and 'Faceoff,' are being viewed in tremendous numbers, on and off HBO. The amount of social media about this event is staggering. "Boxing is in a great place now and is showing a bright future. There is great interest with some of the young fighters coming on board." Schaefer took a beating in the media for refusing to move off Saturday's date for the Alvarez-Lopez fight when the Chavez-Martinez fight was planned. From a boxing standpoint, Chavez-Martinez is more competitive on paper and more significant in terms of matchup. Alvarez is a 14-1 favorite over Lopez at the MGM Grand sports book, while Martinez is a 2-1 favorite over Chavez. But Schaefer was adamant that Alvarez would fight on Mexican Independence Day regardless of what else was going on in the city. "What we're seeing with Canelo is unprecedented in terms of the interest," Schaefer said. "And in this fight, he's fighting a guy who comes to fight every time. It's a great story. 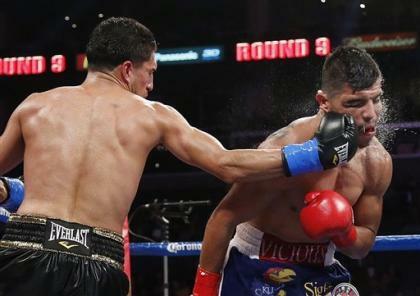 Nobody wanted to give Josesito Lopez a chance when we put him in with Victor Ortiz [in June]. There was a huge fight between the sport's dominant promoters over the date. As it turns out, it's essentially a draw. The hotel rooms at the MGM Grand are sold out for the weekend. Concerts featuring Mexican-themed stars are playing to overflow crowds. And more than 35,000 fight fans have descended upon Las Vegas for the two shows. Millions more will watch either on pay-per-view or on Showtime. Rather than a disaster, it may well turn out to be the biggest fight weekend of the year.